Here Are Things Valentine's Day Is Not. 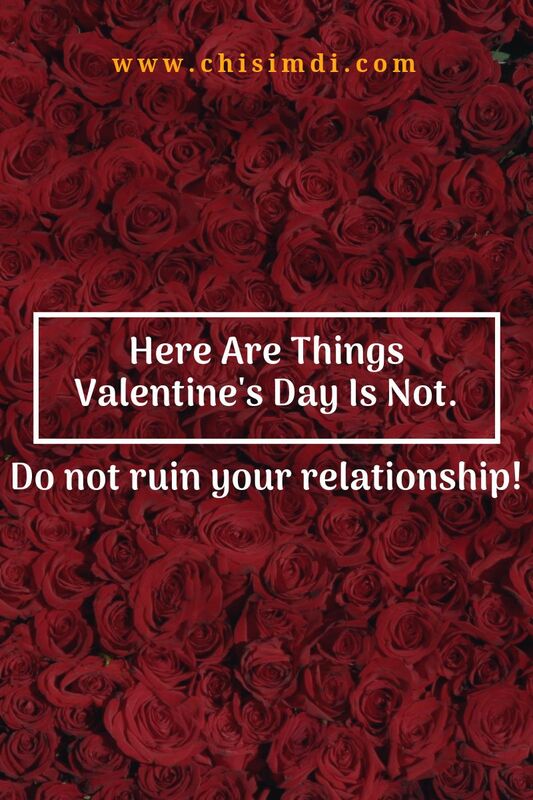 Do Not Ruin Your Relationship! It’s about time; the day the streets are flooded in red and white outfits and you can barely find a free table in restaurants. You can almost not find a free room in hotels too and when you do, it’s double the price because lovers and Valentine’s Day are just like Nigerian politicians and false manifesto; inseparable. Ugh! Don’t miss the point, I totally love love (though I doubt it loves me as much) but I just don’t get what the Valentine hype is all about. Why just 14th February when you can be all lovey-dovey every day and every month, all year round? Well, I’ve never spent Valentine’s Day with a lover so what do I know? The point isn’t that Valentine’s day is useless. It’s beautiful that just as we have days to celebrate other things, we have a day out of the whole year to celebrate love. It should even be more. Problem is, there are people who miss the point. Sometimes, how the day is spent and what one lover does for the other determines the fate of the relationship! Even though I don’t mind being caught up in all the frenzy and being treated specially on that day, I won’t kill myself or sulk up in bed or begin to think my lover is not good enough if it doesn’t happen. Spending Valentine’s Day with you doesn’t mean they love you. It doesn’t even mean they like you. Sometimes, it means nothing. For some, they are merely having fun, following trends and trying not to be left out while you might, on the other hand, be making plans to change your surname name on official documents to his and trying to decide which day is better to take them to see your parents. Being showered with gifts, attention and what you may come to conclude as love might not be love! Do not get it twisted. Don't think the way someone treats you for just a day determines what they feel for you. Your partner not taking the day as serious as you want them to, on the other hand, does not mean they do not love you. It probably isn’t their thing, they might not be available, they may be broke, or whatever but do not use their action for just a day as the yardstick of their love. What happens on Valentine’s Day doesn’t really prove anything but what happens every day. Anyone can put up an act for just a day. If the day is what you expected it to be, awesome! If not, there is 15 February, 16 February, March, April, September, December, and infact 364 and sometimes 365 other days to do whatever with your lover. Every day can be just as special as you both make it. Gifts and lavish treatment are exciting and cool. Everybody likes them. I for one hate asking people for things so when it comes unasked for and unexpected, I can barely keep my calm. 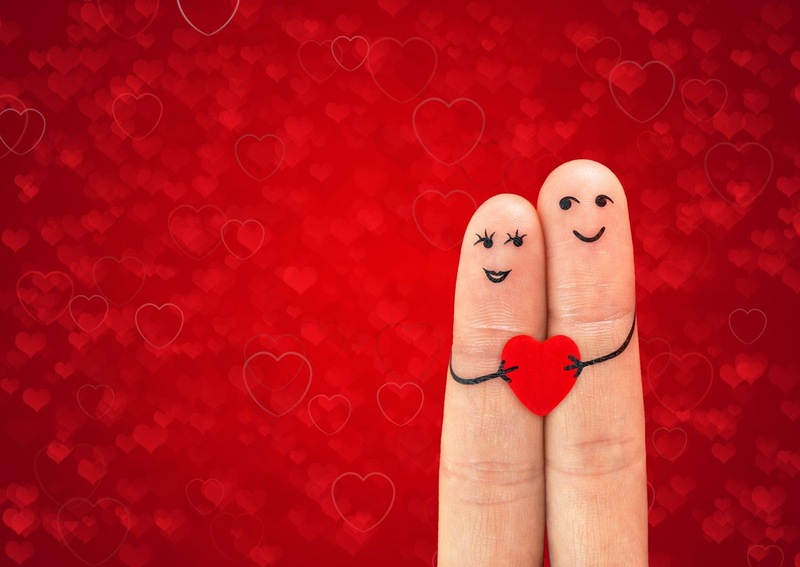 As beautiful as that is, it’s not just what Valentine is all about in a relationship. It can be spent having a heart to heart conversation with them, or some other thing that'd help you both bond more. Don’t let social media define your expectations for your relationship! If gifts and treats come, great, if they don’t, no biggie. It’s Lovers day yea? I love my mum and dad and siblings and friends and so many people. There is enough love to go round and round and round. If I had a dog, I’d love it too or so I think. It’s not written anywhere that I have to find a lover to spend Valentine's Day with and if not, it can't be all or any of the other people in my life. If you have a lover to spend it with and they are available and willing, by all means, knock yourself out but if you don’t, do not kill yourself and die. Valentine’s Day can be spent with anyone, anywhere. All these said, do have a blast on Valentine's Day and every day after that. I do not have plans for Valentine's Day and I’ve not eaten pizza in years. Noooo I’m not insinuating anything but you’d wake up more beautiful tomorrow if you read in-between the lines.